Anyone who knows me know how much I love a cup of tea but with this love comes one major con; it stains your teeth no matter how much you clean them, it does not budge. Along with my love for a good cuppa comes my obsession with white teeth. I’ve tried numerous teeth whitening toothpastes, baking soda, oil pulling, CoCo White and was even sent Doll White. Some of these options are still great alternatives for those who want a more natural approach, but for those of us out there who want an at-home option that competes with what your dentist can provide, there's a way to get it, and at a fraction of the price! 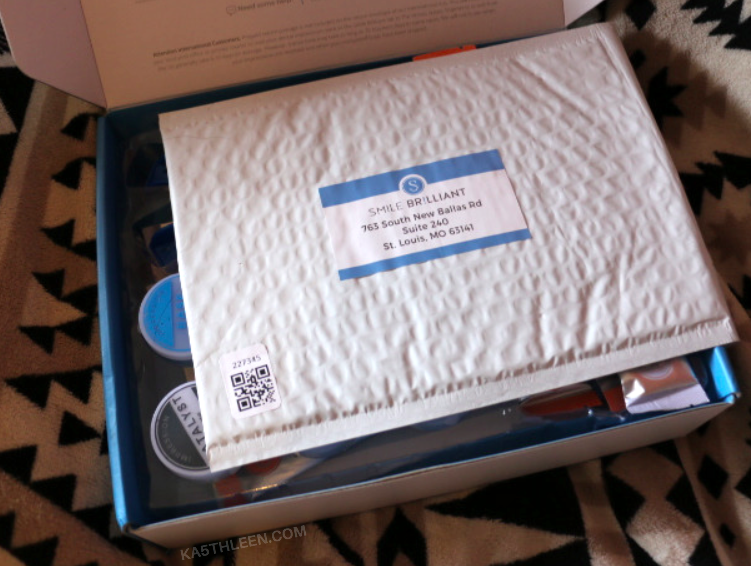 So as an avid tea drinker, imagine my excitement when I was contacted by Smile Brilliant to try their at-home, professional strength, CUSTOM teeth whitening system! At first I was super excited for this opportunity but I still had my worries that this would damage my teeth. 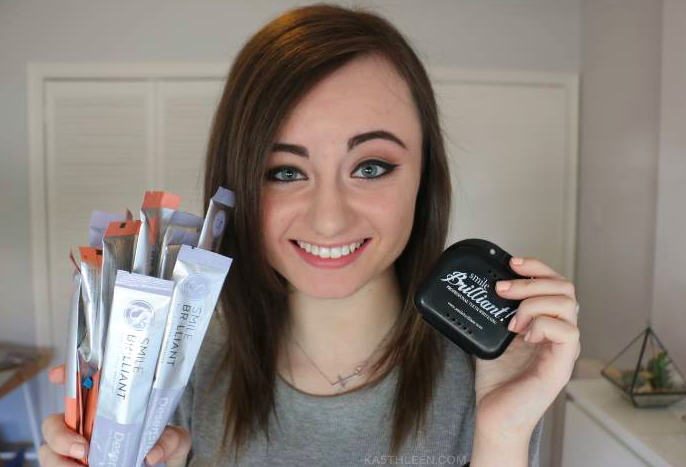 However after reading up on the kit, reading some other reviews and speaking with Jessica (who came to me with this opportunity and guided me through the process and was always there on hand for advice, tips and wee hacks). After being reassured that Smile Brilliant does NOT damage the tooth, I decided it was something that I was definitely interested in and I replied with a hearty YES! 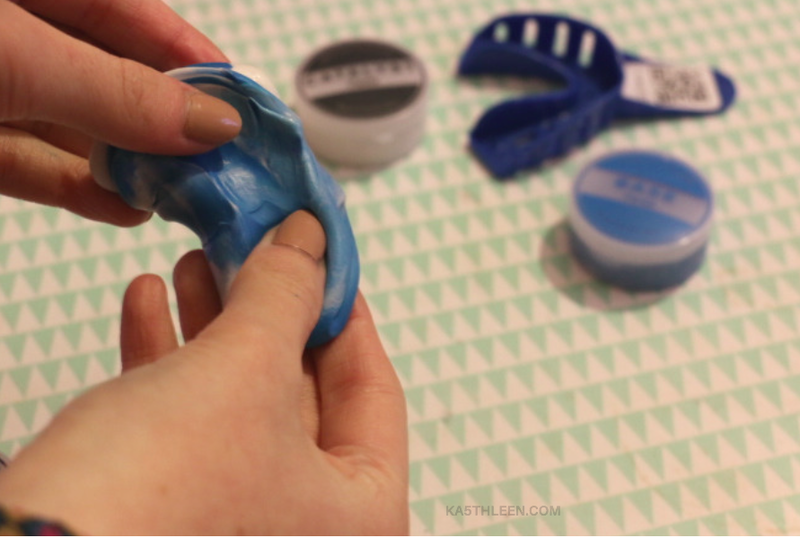 What sets Smile Brilliant apart from other teeth whitening kits and services is that not only do they send internationally, but they send you all the materials to make your own personal mould for your very own trays that only fit your mouth and teeth. 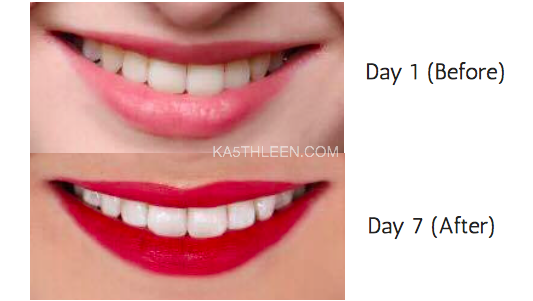 On top of that Smile Brilliant have a desensitising gel step that you use in conjunction with the whitening gel to make sure you are sustaining the integrity of your tooth enamel and keeping it intact whilst preventing agonising and dreaded sensitivity that so many avid ‘teeth whiteners’ experience. This entire kit I received (minus one whitening and desensitising gel) retails $165, so just under £133 when you could easily be spending £1000 give or take at the dentist. 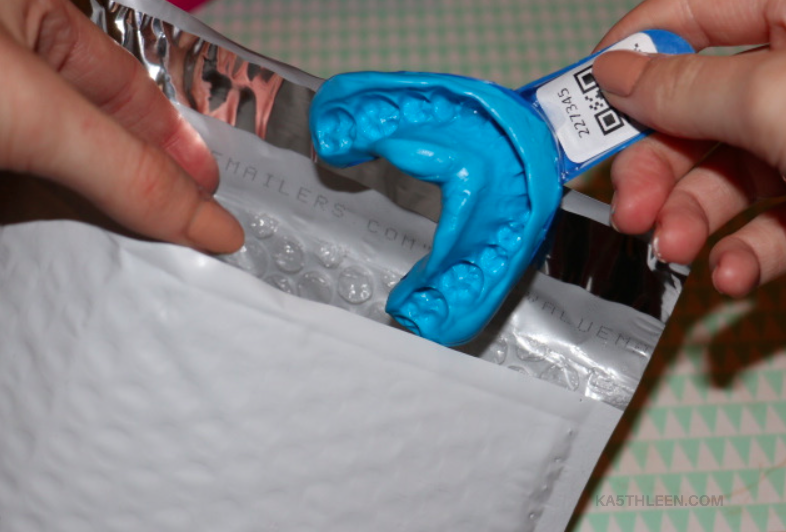 You are sent all the materials needed to create your own personal teeth mould to send back in the padded envelope that is included. The process is very simple, in that all you do is take one lot of catalyst paste and one lot of the base paste and mix them together in your hands until it is all one colour. Then roll it out into a sausage shape and distribute it evenly in the trays provided and then place in your mouth by pressing up evenly into your top set of teeth and straight down for your bottom set, making sure not to slide them about (Don’t worry if you make a mistake! They send an extra tub of each paste just in the case!). 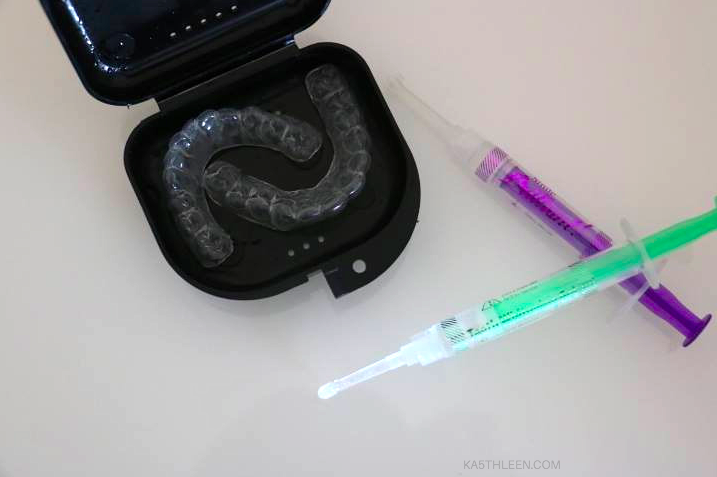 Your whitening gel and desensitising gel is sent at this stage too, each syringe is individually packed and will last the minimum of three applications (both top and bottom). Also included is a great, detailed instruction card with plenty of instructional photos that explains how to use your gels and how much gel to use, along with helpful tips and tricks. They also have instructional videos available as well as a FAQ page. Here is what the process looked like for me. Once I created my moulds, I let them sit overnight before sealing them up in the provided envelope and sending them back via the post office. Once they receive your moulds an email is sent to you notifying you that they received them and then they keep you updated on the tray making process and when your custom made trays have been shipped out. However, throughout this process from the beginning I have kept in contact with Jessica so after not getting any notification that they received my moulds, I asked her if the lab had received them which she got back saying they hadn't yet but it wasn't extremely unusual for a hold up at customs. Despite this either way she was going to send out new material but before that the next again I was greeted by an email from her saying “SUCCESS! WE GOT YOUR TRAYS MADE! My lab didn't have your order number, so all is well! SHIPPING OUT TODAY!!!”. After that it didn't take too long for my custom trays to get to my door. The customer service at Smile Brilliant is incredible. They work so hard in order to help you in any and every way possible and are always extremely friendly. If you have any questions during the process, they are always on hand and available via phone or email to help you out. It’s literally the best experience with customer service I’ve had! On arrival, they come in a little travel case with your new unique-to-you trays inside. The trays are clear, thin, and a perfect fit! Unlike the generic trays you will find in whitening kits in the stores, these are soft, flexible and extremely easy to use. 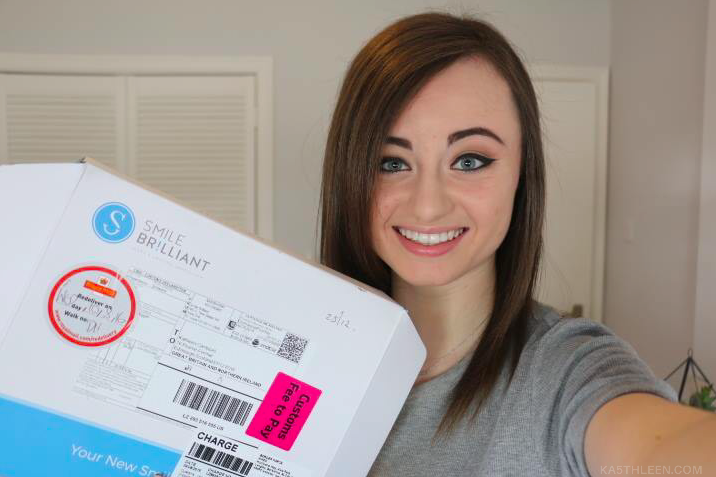 Smile Brilliant is one of the only teeth whitening companies that offers 100% personal fit trays (instead of the one-size fits all mouth guard type of trays which NEVER reaches the whole area of the tooth and NEVER gets into all the nooks and crannies of your mouth). And now for the results, the most exciting part. These images have not been edited in any way. You can definitely see some staining on the surface and in between my teeth before using this whitening system. 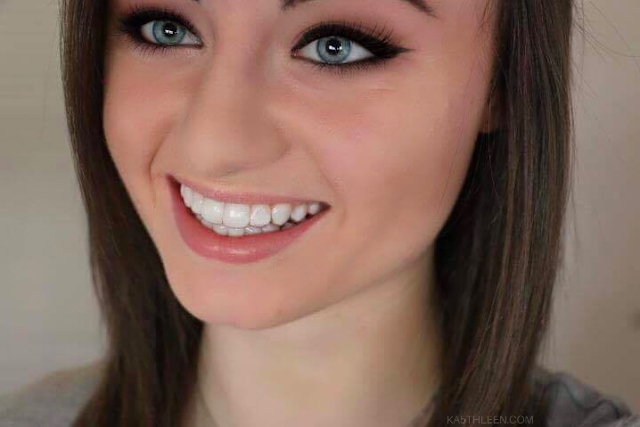 You can really see my teeth are a whole lot whiter and overall have definitely brightened up. This was only after a week of using Smile Brilliant. I was actually was wearing the trays using the desensitising gel in the above photo. I would literally go out and walk my dog wearing them, they are so unnoticeable! In spite of being completely honest with my readers, I want to also note my teeth sensitivity I have experienced as a result. In the 6 days of using Smile Brilliant I had built up to keeping my trays in for three hours, keeping them in only 45 minutes the first two days and then increasing the time each day. By the time I took my trays out on day 7 the bottom of my top set of front teeth felt ‘sore’ but subsided by the next again day. It’s hard to describe the feeling of tooth sensitivity and though I had never experienced tooth sensitivity before, I knew that this was exactly what I was experiencing. I got back to Jessica again just explaining this and she got back with some very helpful tips and advice suggesting many ways, one of which was to use the desensitising gel even on the days I don't use the whitening gel. The reason I am telling you this is so that you can prevent tooth sensitivity and essentially prevent making the same mistake I did. I think what I done wrong was working up to keeping the trays in for three hours too quickly. I have only used the trays since then a couple of times for only a day at a time to keep the whiteness and brightness in my teeth and haven't had any tooth sensitivity. The really cool part about using Smile Brilliant is that it only restores your natural whiteness of your teeth, so you avoid the fake, ‘glowing’ white that you can always identify as being unnatural. After your initial treatment, you really only need to touch up your teeth maybe once a month if you notice any staining. I love that I don't have to worry about whitening every week, after all, low maintenance is what we are all after right? 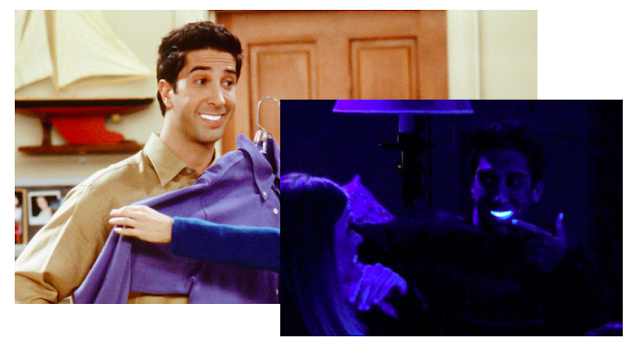 What I really like about my results is that the staining is clearly gone, but my teeth don't have that unnatural ‘blue tint’ essentially to them that I felt I got with a previous whitening strip brand I tried that left me feeling like I was going to glow under a dark light - like Ross from Friends, if you remember that episode? 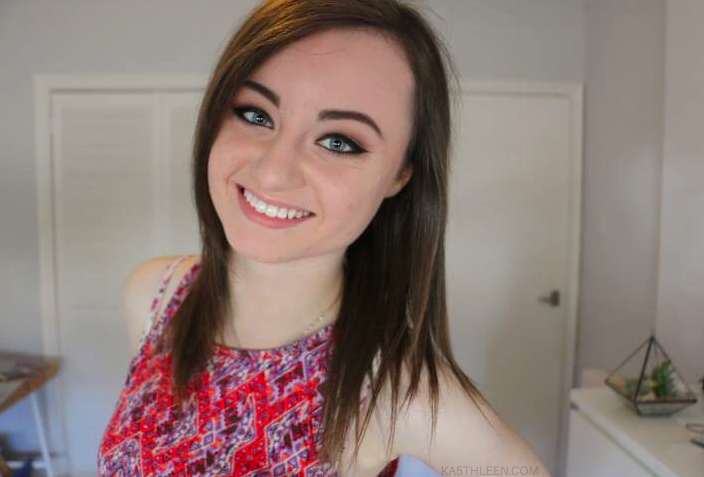 Now it just feels like I have a bright white smile, but still natural looking and healthy. When ordering your kit, you can choose how many syringes of whitening gel and desensitising gel you want, it’s completely up to you. I was originally sent six of each then additionally sent another one of each with my trays I think because of the delay in shipping my trays. I would say I am stocked up for the next wee while as though they say one syringe does at least three applications (including both top and bottom sets of teeth), I found that one syringe lasted me 6 days, maybe slightly less with the desensitising gel. 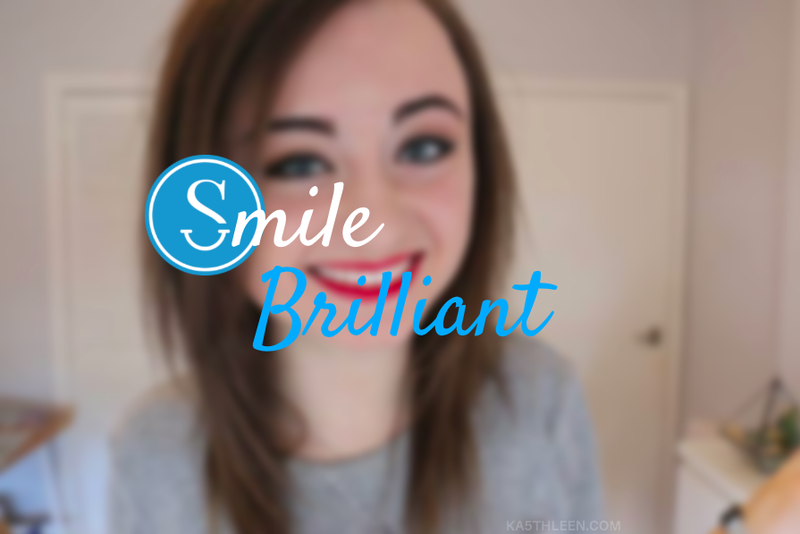 So whatever your reason for wanting to have a brighter, whiter smile, I couldn't recommend Smile Brilliant any more. With its ease of use, wonderful customer service, and a reasonable price, it’s definitely a teeth whitening product to try out. Why not grab your own kit and now with 10% OFF store wide by entering here for the coupon! 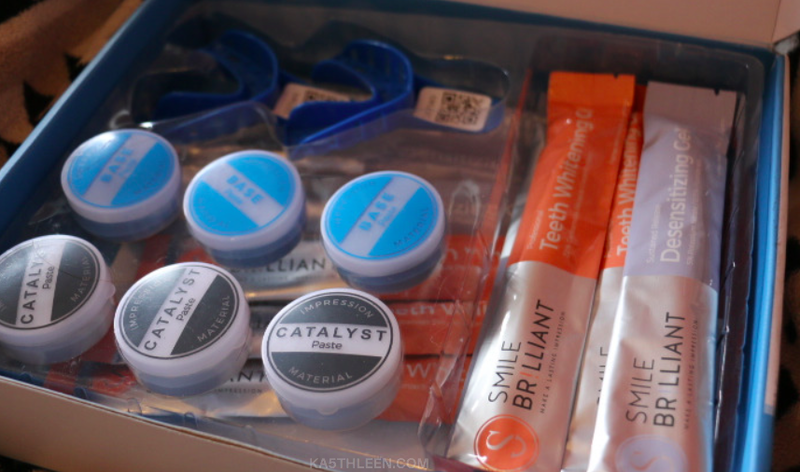 Please note: All products reviewed on this page were sent to me complimentary from Smile Brilliant. I only recommend products or services I try personally and believe my readers will enjoy. All opinions are my own.